EMBARGOED UNTIL 09:30 UTC Monday, October 3, 2011. Highly specialized, scientifically advanced antennas come together to capture never-before seen details about the cosmos. North American 12-meter telescopes in the growing Atacama Large Millimeter/submillimeter Array (ALMA) at 16,500 ft elevation in northern Chile. ALMA is only one-third complete, but is already the most powerful astronomical observatory of its kind. NEWTON, N.C. -- Thirteen 12-meter antennas manufactured by General Dynamics SATCOM Technologies have been successfully installed at the 16,500-foot-high Chajnanator plateau in Chile, home to the Atacama Large Millimeter/submillimeter Array (ALMA) astronomical observatory. Located in the Andes mountains, the 115-ton, highly specialized antennas form part of an 11-mile-wide international astronomy project. When it is completed in 2013, scientists will use the observatory to study portions of the universe at a level of detail that is beyond what current astronomical technologies provide, studying the origins of galaxies, stars, and planets. Now, in a preliminary step, the General Dynamics-built antennas are being linked together for the first time with others made in Europe and Japan to begin operating as a single radio telescope, enabling initial scientific experiments or 'early science.' One top-rated science experiment will use ALMA to unearth the behavior of about 50 of the most massive black holes in the universe previously hidden in the dusty material of their galaxies. 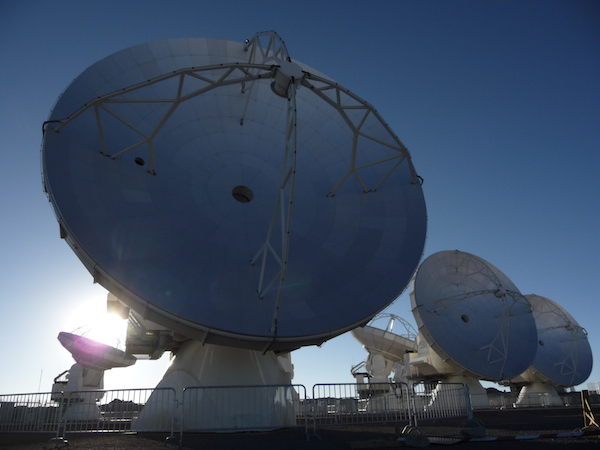 "The installation of the General Dynamics antennas on the Chajnanator plateau represents a significant achievement for the North American portion of the ALMA project," said Brian Schrader, senior director for General Dynamics SATCOM Technologies. "We've provided the majority of the antennas now allowing scientists to pursue projects that use ALMA's eyes to make large leaps in exploration." "With ALMA poised to commence historic early science observations using at least 16 of its final 66 antennas, it is already the world's most powerful astronomical observatory at millimeter wavelengths. We're grateful to the entire North American ALMA antenna team, of which General Dynamics SATCOM Technologies is an integral part, for working so hard to make this day possible," said Mark McKinnon, North American ALMA project director at the National Radio Astronomy Observatory (NRAO). In addition to its antennas at the high site, General Dynamics has delivered another four antennas now in various stages of customer acceptance testing at the at the ALMA Operations Support facility, 7,000 feet below the Chajnanator plateau. Once complete and ready for operation, the antennas are carried by a custom-built transporter to the plateau where each is attached to a concrete platform and connected to electrical power, fiber optics and other services. ALMA construction and operations are led on behalf of North America by the NRAO which is managed by Associated Universities, Inc.
For guided video tours of ALMA, please enjoy the NRAO ALMA Explorer. General Dynamics SATCOM Technologies, part of General Dynamics C4 Systems, is a leading supplier of emergency, strategic and tactical satellite ground terminals. Additional information about SATCOM Technology's products and services is available on the Internet at www.gdsatcom.com. The Atacama Large Millimeter/submillimeter Array (ALMA), an international astronomy facility, is a partnership between Europe, Japan and North America in cooperation with the Republic of Chile. ALMA is funded in Europe by the European Southern Observatory (ESO), in Japan by the National Institutes of Natural Sciences (NINS) in cooperation with the Academia Sinica in Taiwan and in North America by the U.S. National Science Foundation (NSF) in cooperation with the National Research Council of Canada (NRC) and the National Science Council of Taiwan (NSC). ALMA construction and operations are led on behalf of Europe by ESO, on behalf of Japan by the National Astronomical Observatory of Japan (NAOJ) and on behalf of North America by the National Radio Astronomy Observatory (NRAO), which is managed by Associated Universities, Inc. (AUI).